Why are Pressure cooker manufacturers gaining high profit? There are several benefits of cooking food using pressure cooker. Hence, a good number of pressure cooker manufacturers have made their presence felt in the market. Did you know that pressure cooker is the answer to healthy cooking? Steam is the main factor that makes pressure cooking healthy. The nutrients and food value of the food is not lost during the process of cooking. Since there are several other benefits of cooking food using pressure cooker, a good number of pressure cooker manufacturers have made their presence felt in the market. Let us have a look at the reasons why pressure cooker manufacturers are making huge profits in the business. 1. Pressure cooked food tastes better as it has the steam in it. 2. Pressure cookers prepare the food very quickly when compared to other modes of cooking. The food cooked is also softer. 3. If you are in hurry and want to cook your food in no time, there can be no other alternative than cooking in pressure cooker. 4. Almost all recipes can be cooked in pressure cooker. 5. You can save much of your fuel as the food gets cooked quickly. Thus, you are saving on your expenses as well. In fact, compared to traditional ways of cooking, pressure cooker helps you save up to seventy per cent of your time and money. 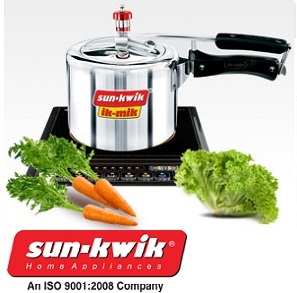 With all such positive qualities, pressure cookers have become a must have in all kitchens. Pressure cooker manufactures are coming up with cookers with different capacity and a variety of designs. The cookers are available with induction base also which make them suitable for cooking on induction cookers. You may buy the cooker which perfectly meets your needs. How to buy the perfect pressure cooker? Pressure cooker is of immense use to cook food. 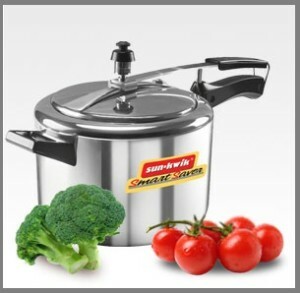 The stainless steel bodied cookers with a steel – aluminium – steel base are the best pressure cooker products. Pressure cooker is of immense use to cook food. It not only prepares food very quick byt also retains the food value. Hence it is very much essential to have a pressure cooker in kitchen but the question raises how to buy the perfect pressure cook? In today’s market there are several pressure cookers which are designed according to the need and requirement of different users. Pressure cooker comes in various sizes. You should but the size which perfectly suits your equipments. If you are a single person then you should always choose the small size pressure cooker. In case, there are many people in your family and if you often have guests at your place, then you must decide in favour of pressure cookers of bigger measurement. Stainless steel cookers are more resilient, simple and easy to clean. They look better and are corrosion, warp and scratch immune. Owing to these qualities, stainless cookers are more expensive. On the other hand, the aluminium cookers are better conductor of heat and are less expensive also. Sadly, they get dented easily. 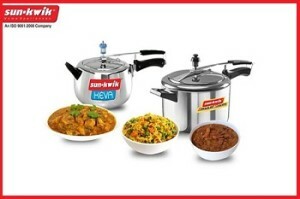 The stainless steel bodied cookers with a steel – aluminium – steel base are the best pressure cooker products. The sandwich base of aluminium conducts the heat uniformly and thus cooking food faster and thoroughly. The body of the cooker is of the very good quality material. They also last for several years and are easy to maintain too. Purchase prices of cookers depend on the brand, variety and size. But, it is always advisable to buy pressure cooker products of reputed brand. One must also be cautious while handling pressure cookers as carelessness may lead to accidents. How pressure cooking is effective? A pressure cooker is one of the cookware which is always handy in the kitchen to make cooking faster and easier. It is indeed important that one must have a cooker from a reputed pressure cooker manufacturer and spell bliss in the kitchen. A pressure cooker is often considered as a very old fashioned cookware but if the utilities of a cooker are considered then it is one of the most significant essentials in any kitchen. The cookware does not cook your food faster but it is also helpful in retaining the taste and health of the dish accurately. In pressure cooker, the mechanism is such that the temperature increases automatically and thus steam is formed, which facilitates fast cooking. The food preparations for which pressure cooker is really useful include roasts, stews, cooking fresh vegetables. The cookware is also beneficial in pressure canning food as it heats and cools very fast. The pressure cooker manufacturers offer cookers of various shapes and sizes and depending on the size a cooker can hold about 4-6 quarts of food. Mostly the cookers come with a low, medium and high setting but there are few advanced models that bear weights of different values for cooking at a desired pressure. As it is already told that the food is cooked at a rapid pace within the cooker as steam is created within the cooker. The steam remains trapped within the cooker with the aid of a rubber gasket and thus the steam helps in cooking the food more effectively as it keeps on penetrating the food and thus every part of the food get well cooked and that too within a short time span. This is not possible in any normal cookware and to some extent can be attained by putting the temperature at the shimmering point. Still the major benefit remains unattained. There is no end to the versatility of a pressure cooker when it comes to cooking a quick, healthy and tasty delight. The pressure cooker manufacturers are constantly experimenting with the mechanism of the efficient device. Here is a short overview on the advantages put forward by it. Pressure cooker in technical terms is a simple pot that comes with a special lid that seals it completely in a way that no steam formed within the pot during cooking can escape. In order to pressure cook, it is indeed important to put water within the cooker which boils eventually and creates the steam inside. The steam unable to find any way out, keep raising the pressure inside the cooker and thus the rising pressure and temperature keep on correlating, meanwhile the food is cooked appropriately. The pressure cooker manufacturers continue to offer newer and innovative varieties of cookers but the basic mechanism remains all the same. Here we will just have a brief overview on the mechanism of the pressure cooker that facilitates cooking food in a faster, tastier and healthier way. If water is boiled in a normal pot then the boiling water can never reach 100 degree centigrade however high the flame would be on which the pot is placed. The process turns out to be longer too. On the contrary if the water is left to boil in a pressure cooker then the temperature can easily rise to 121 degree centigrade and the cooking time diminishes drastically. In pressure cooker the cooking is indeed faster as the food is cooked at a rate of 70-90% faster than when they are cooked in a normal utensil. As in pressure cooker the lid remains absolutely sealed so alongside shorter cooking time lesser fuel is utilised in cooking. Hence the method is energy efficient too. The food cooked in pressure cooker is healthier and tastier as the nutrients inside the food never get evaporated and remain intact. Thus, the method is natural in a way as it never zaps the food but uses the atmospheric power instead. Last but not the least, a pressure cooker can perform multiple functions rather that just normal cooking. 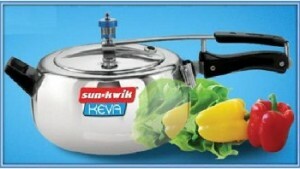 It steams, stews, boils, braises roasts, cooks rice, and extracts juice and several others. The method is time tested and advantageous. Therefore, the utility of pressure cooker will never diminish and the pressure cooker manufacturers will continue cashing the advantages rendered by the device.